Graham married Wheaton College classmate Ruth Bell Graham in 1943. They had five children ( R Billy Graham was an American evangelical Christian evangelist and an ordained Southern Baptist minister. Graham is best known for his evangelistic missions or “Crusades.” He believed God knew no borders or nationalities. 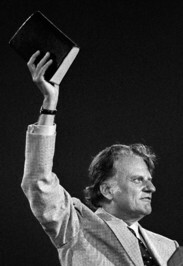 Throughout his career, Graham preached to millions around the world. He met and prayed with every U. S. president from Dwight Eisenhower to Barack Obama. Graham married Wheaton College classmate Ruth Bell Graham in 1943. They had five children ( Ruth Graham, Gigi Graham Tchividjian, Anne Graham Lotz, Nelson, & Franklin Graham) and made their home in the mountains of North Carolina. They were married for 64 years before Ruth’s death in 2007. Graham died from natural causes on February 21, 2018, at his home in Montreat, North Carolina, at the age of 99.